This pie's gentle, lofty, custard filling tastes faintly of nutmeg and potently of rhubarb. 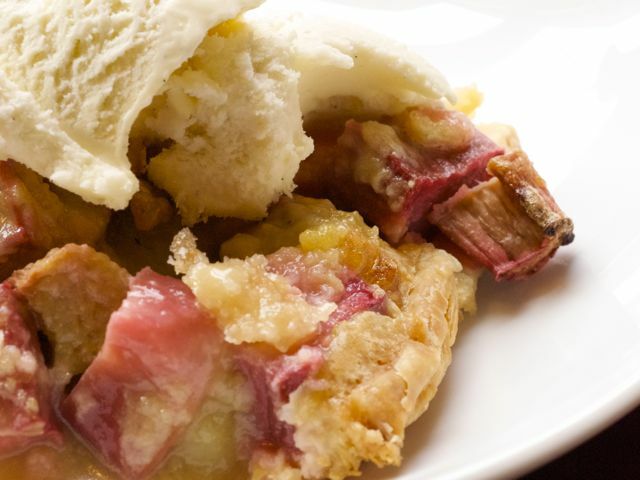 This treasured recipe comes from Jen's Grandma Adeline, who, as a young girl growing up on a Nebraska farm, was given the nickname "Sour Rhubarb" by her family — in part due to her ornery personality and in part due to her funny habit of snacking on rhubarb stalks straight from the garden. Adeline's pie is now in Bubby's repertoire and it sure moves fast in the spring. Because this pie has a custard base, it is best made as a single-crust pie. Bake the pie for 45 minutes, or until the center looks cooked and does not jiggle when the pie is nudged (do not use a two-temperature bake for this because it's a custard pie). Cool the pie almost to room temperature before serving.